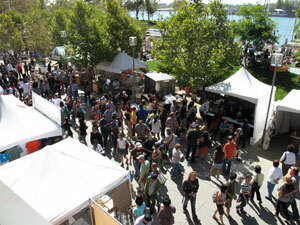 This is Part 1 of a two-part special on Meatopia and Oakland’s Eat Real Festival. You can read Part 2 on the Burn! Blog here. “Call me tonight if you can.” Doug Keiles’ mysterious Facebook message greeted me one Sunday afternoon a few weeks ago. I thought it meant a reading of the riot act about my interview with Doug for the Burn! Blog. Far from it. Let’s see. Swelter in the L. A. heat all weekend, or head to Northern California to assist a guy who’d just been on Chopped: Grill Masters in a barbecue competition. Hmm. A hearty, “Hell, yeah” later, I was emailing Burn! publisher Dave DeWitt on the idea, to see if he’d want a story about it. He was almost as enthusiastic as I was. Flight arrangements were made and attending was a done deal. The only downside was that I’d miss the Space Shuttle Endeavour landing at LAX by an hour, but I knew the Oakland opportunity would be worth it. And I was right. I was thrilled because I’d be working with Doug and team mate Jonathan Knopf. But the barbecue competition was only half of the deal—I was going to Meatopia. Whether a steer once kicked sand in Meatopia creator Josh Ozersky’s face, or was just guilty of tasting wonderful, the rest of us carnivores get to enjoy Meatopia because of it. Over the last nine years Mr. Ozersky, a successful food writer, editor, and TV producer, has grown Meatopia into a celebration of prey animals in all of their succulent glory. Josh confined previous Meatopias to New York but this year, he added one to Oakland’s Eat Real Fest out here in California. Here’s how Meatopia works: each year, the participating chefs craft some very wonderful eats using meat that’s certified cruelty-free, hormone-free, and antibiotic-free. You also get to talk with them on a personal level, which was a pretty wonderful experience. What’s more, the chefs work only with wood or charcoal to cook the meat. No gas, no electricity. They’re also asked to conjure a recipe unique to the event itself, in order to give attendees an eating experience they won’t find even in the restaurants of the chefs making the food. Part of my deal with Doug had me helping him with the dish he’d planned for the Friday dinner part of the program. Meatopia West (as I call it) had different events for each day of the show—the traditional dinner outlined above on Friday, Bare Bones on Saturday, and a milk-fed brunch Sunday morning. Although Doug Keiles wasn’t on the meat hook for the Sunday event, almost a thousand hungry mouths were expected for that Friday dinner and he wanted help to get them fed. All I really knew when my plane touched the Oakland tarmac Friday morning was that I needed to be in Jack London Square before 5 pm to help out. Just to be on the safe side, I got there around 1 pm, since I knew Doug and Jonathan would be smoking some sort of dead animal all day. My afternoon meander brought me to the fenced-off area reserved for Meatopia. The crowd was in its infancy; some booths and food trucks in the square were still setting up shop for a weekend of hawking locally grown culinary creations to the masses. The crowds really turned out for Meatopia! When I got to Doug and the Ribs Within Booth, I was greeted by two things—friendliness and a mountain of bok choy in need of a good chopping into little tiny pieces. Ben Lobenstein showed me the drill, and eventually I got more practice cutting big bok choy into little bok choy than I’d ever planned on. It didn’t take me long to deduce that there’s not a whole lot of meat on fresh bok choy. Having informed Doug Keiles of my clever observation, he answered by introducing me to the star of his show—a slew of lamb roasts smoking in the same Charbroil barrel grills we’d be using during the Bare Bones competition come Saturday. We were setting off the lamb with a bok choy ragu. The next three hours were a mixture of camaraderie and barked orders offset by the smell of smoked lamb nearing readiness. This is also when I was introduced to the guy in the booth next to us—a dude in a Kingsford shirt with sunglasses and a goatee. 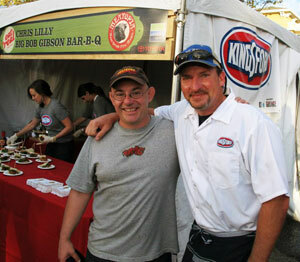 Me with Chris Lilly in front of the Big Bob Gibson/Kingsford booth at Meatopia. Note the huge, goofy grin (on me, not Chris). Yeah, that Chris Lilly. He’s Kingsford’s spokesman, Kingsford sponsored Meatopia, and I’m pretty sure you can finish that math equation on your own. 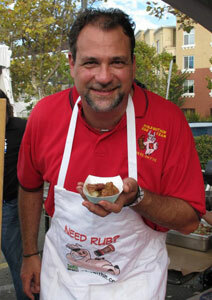 He’s also a partner at Big Bob Gibson Bar-B-Q. Chris, Doug, and Jonathan were friends and I was getting to hang out with them both days. The Space Shuttle would just have to land without my help. By the time dinner ended at 9 pm, most of the chefs were out of food, including Doug and Jonathan. The real fun would take place Saturday when Meatopia turned from a dinner date into a competition. But if you want to read that story, you’ll have to head over to www.burn-blog.com. 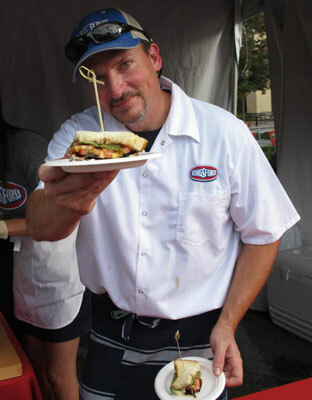 You can read my interview with Doug Keiles as he talks about his experience appearing in Chopped: Grill Masters on the Burn! Blog here.